May is lovely- but can be wild too. As we have seen this weekend in Santa Fe- a foot of snow!! It is such a transitional time, the last burst of winter before it finally passes. I looked back on my calendars and it does usually snow every year in the first week of May, so though odd, it is actually to be expected. The hardiest of the winter vegetables are Kale, Collards, Peas and Spinach which can take Temps as low as low 20’s and in the high teens. Broccoli, Brussel Sprouts, Cabbage, Kohlrabi, Mustard Greens, Parsley, Radish, Parsnip, Turnip can all take temps 28-25 degrees. All of these can survive under thick row cover all winter, though they may not show many signs of growth, they will start to spring new leaves in February. So not to worry, the storm has passed, we have gathered the moisture and now we prepare for hardening off and the planting out process… More on that to come. I plan my garden very strategically so that there isn’t much work to do in June and July… For many reasons… Maybe first because I was a garden teacher for so many years that I planned spring and fall gardens with very little summer maintenance. Even though I am not running a school garden this year, I now have a tiny baby and can’t really garden much at all…so it is convenient that I don’t have much to do but harvest in the high heat. It is also convenient for leaving town during the hottest, driest time of year which we all want to do. Yeah for harvest help from our good friends from Ampersand, love you guys!! And probably the biggest reason I plan so much for spring and fall gardening is that is when gardening in the high desert is at it’s best! There is cool air, cooler soils and real water falling from the sky! I start things outside as early as February (my pea crop was started then and yielded my best crop yet!) and am eating out of the garden till Christmas eve. Summer is for being lazy anyways right!? So though I am still being very lazy, I am starting to think about the transitions about to happen out there, the good old ‘fall flip’. This is when I pull out all the lettuce and peas that have stopped yielding and bolted into pure bitterness that may still remain and I plant a whole new slew of cool season crops. Because it is only the 9th of July I can still plant a nice beet & carrot crop. Later in the month I will plant more lettuce, spinach, cilantro, and whatever other cool season greens I wish. I also have started planting big beautiful marigolds this time of year to have for autumn garlands. High summer I hear a lot of people say, ‘oh I am too late to have a garden this year’…but you are not! Autumn harvest is within reach. Plant now and you will abundance you will reap!! What a spring we have had! Erratic whether, moisture, crisp cool air, and really spring greens like nothing better! I have begun harvesting multiple pounds of Lettuce, Spinach, Kale, Chard and Chinese Cabbage every week and just wish I had more garden space to plant more. If you are doing succession planting in your garden planning, timing and leaving space for the future is everything!! You have to think about how long it will take for a head of lettuce to produce,(about 60 days in the spring) and then plan what you will pop in its place once harvested. In these pictures above and below you can see I planted Cabbage babies among the cut and come again Lettuce, so that by the time the Lettuce is bitter the Cabbage will take over. I usually plant a lot of cut and come again varieties of Lettuce, Spinach and Kale and Chard so I don’t have to keep planting…but this year I knew I could sneak in a bunch of head Lettuce before the warm season crops needed the square footage, so now the garden is full of butterhead and romaine varieties so I can remove the whole plant and put in warm season crops the same day…..lots of salad ahead for Mama’s Mini Farm CSA! Which is to say I have found that if you shade cool season greens in the high summer they really like it and last longer. 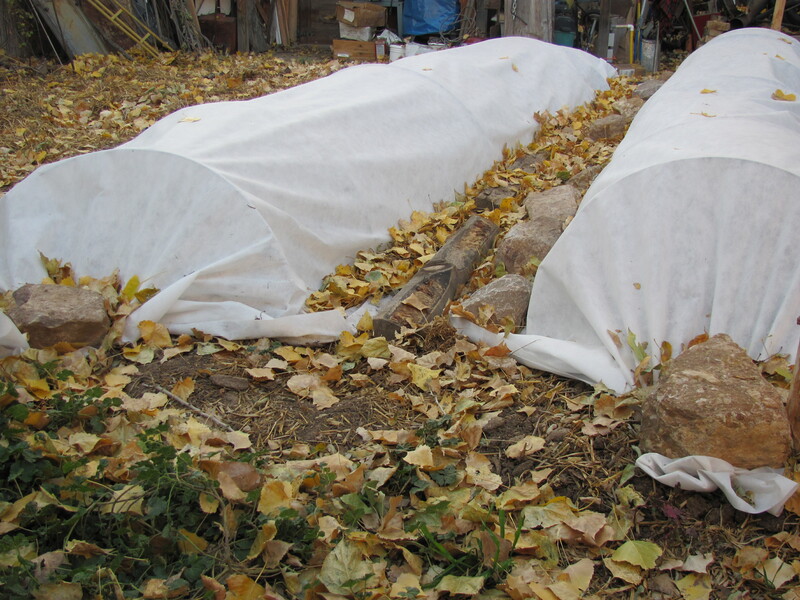 As you already know I am a huge fan of row cover for a long list of reasons… but when it gets too hot and plants don’t get enough fresh air they can get very flimsy and over succulent. So much so that they couldn’t survive one day in full exposure and they will just turn to mush before your eyes, so I try to gradually remove the row covers for more and more hours at a time to toughen them up to the real world. I often raise the row cover so wind and beneficial insects can find their way in on the ends, because another set back of having your crops under constant cover is pests, namely good old aphids can take over while you aren’t watching. At some point when cool spring breezy days shift to hot summer days, Often around June 1st. I take the row cover off all together and replace it with shade screen. This lets light, water, and beneficials in, but it takes the edge off those sweltering afternoons that will cause a cilantro to bolt in one day! I have found in full sun gardens these shades are very helpful for almost all crops even warm season crops, throughout the whole summer. I have learned my lesson with more than one June hail storm destroying my precious babes! More info on what to use is in this previous post. So if you aren’t out there already….get sowing!! You can plant pretty much any cool season crops, flowers and roots right now and in a few short weeks it will be tomato time!! Hooray! I have written many times about growing sprouts at home cause it is just so darn easy and rewarding. I have lots of friends out there who simply can’t start vegetables indoors but sprouts only require attention for 10 days or so and really only need heat and water and a little sunshine. You can grow them with kids and they just love it and you could just keep that going and forgo a garden altogether and still get a constant supply of yummy fresh food for your table. Here is last years link on growing sprouts and Micro greens. But seeing as today and tomorrow are leaf days I thought I would remind you to sow some sprouts indoors. Happy Spring everyone and Happy Sprouting!! Last Saturday I gave a public class on Seed Starting at Earth Care community garden. It went well and was well attended but made me realize a few things…..One was that a little re-cap may be useful, as people tend to have the same questions and quandaries about starting seeds indoors. Containers and Soil– There are of course so many choices, so I encourage you to use what you have and find what you like. My favorite are wooden flats so here is a link to making your own out of old pallets or new wood. I also prefer to make my own soil, so here is link to that, but of course find your method of ease a pleasure. Just remember for seedlings fluffy and light soil is best- high in peat moss or Coconut fiber. Once the seedlings the bigger they will need more nutrient rich mix or a rich garden bed and I will write more on that later. Temperature– Seedlings need different soil temperatures to germinate. For example some lettuces can germinate in soil that is 50 degrees and Tomatoes often need 70 degree soil. Here is a great Vegetable Planting Chart form High Mowing Seeds blog that has great info on soil temp, germination times, spacing and more. 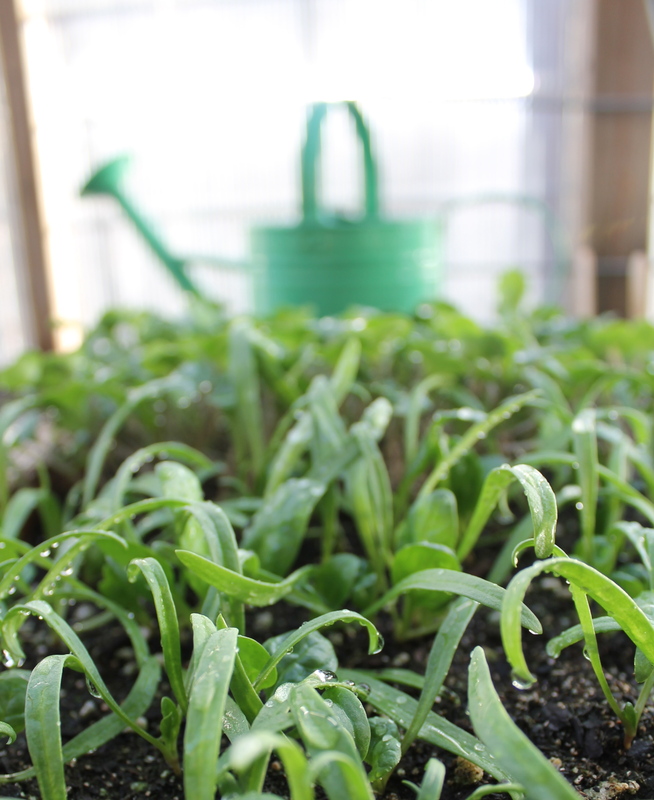 If you are starting your seedlings inside, the soil is probably stable at the temperatures of your house, but if not they are in an unheated greenhouse or cold frame, it is probably much colder. I simple Soil thermometer, purchase at any nursery, should help you see what your soil temps really are. Check it morning and evening to see how it changes. Also check your seed packet to see if it tells you ideal soil temperatures for germination, so you know if you are waiting long enough before starting over. Remember if you seedlings haven’t come up yet, they are just waiting for the right chemistry, so don’t give up. Just keep working the elements of warmth, light and water till you see those sprouts. If you need to you can buy seedling heating mats here. Light- This seems to be the most tricky for home growers. Many windows simply don’t get enough DIRECT sunlight. Choose a south-facing window that gets direct sun ALL day, that is at least 8-10 hours a day. The more the better. If your seeds sprouts but then get really long and leggy and look like the are desperately seeking the sun, you probably need to supplement with electric lights. So many people know so much more about that so google that. Water- Seeds really only need the right temperatures and moisture to germinate, that is sprouting before photosynthesis. Once you sow seeds (in a moist sowing mix) you MUST keep them moist at ALL times. Yep, Always!!!! that means watering many times a day if you need to, especially in a heated house in a south-facing window in the high desert!!!. A helpful tool may be a spray bottle. Set it on a fine mist and mist the soil. If you have children helping this is a great job for them and really can’t be over done. Once you see puddling on the surface of your soil, stop watering. A watering can with a fine sprinkle really is necessary, as big flows of water can wash the seed right out of the soil. Because the seed is only in the first inch of soil, this is what need to be moist. Once a plant grows the water needs to go deeper and the plants can be watered less frequently, but int he the beginning, moist always. Water quality has an effect too. I use my precious rain water for seedlings and really have noticed a difference from the years I have used our hard well water. Tap water is ok, but it is best to fill your watering can or a big bucket hours, or days before you water so that the chlorine in the water can evaporate and the water can come up to room temperature. Cold water can shock plants and of course chlorine can harm them. Seed Needs– Each seed of course has it’s own temperament. Some like to be planted deep, some with no soil at all. Some need fire, freeze or even scaring to crack their seed coats. They say a generally to plant seeds twice as deep as they are wide. Seed packets are great source of information, but if you don’t have packets, the High Mowing Vegetable Planting Guide works great to find out all the little special needs of each of your precious seeds. So there you have it– If you seeds are warm, wet, sunned and in a good growing medium they should come up just fine. Plants are more like us than we might think. If you are cold, they probably are, too hot, the might be too. Now planning your sowing timing and taking care of the babies well so that they thrive and are ready to go outside when the times comes, oh and of course there is seed starting outdoors as well…..but I think I will write more on that later, for now this should get you started if you haven’t jumped in already. Happy Seed Sowing! Is there anything you can’t make out of an old pallet? Yes, it does take more time and a bit more know-how to upcycle a pallet into a totally different and functional thing, but luckily I have an expert on my side. Yep, Joel does it again. This time he made me a new seed planting flat out of recycled pallet wood. Cool Huh? Want to try? Here is how he did it. First, he tore the pallet apart with a flat bar to get the the lumber in order. Then he cut off the split tips with the nails in them- to have clean, split free ends and not to bother with pulling out the nails. He nailed 2 of the 2footers & 2 of 1footers into a rectangular box. The 2 footer edges over lapped the edges of the 1 footers. Unfortunately he moved so fast I didn’t get to photograph every step… but I hope you follow. Then he nailed the remaining 4 2footers to the bottom of the box using 4d galvanized nails. These are rust resistant and small enough that they will keep the wood from splitting, but large enough to hold your box together when it is full of heavy, wet soil. Because the wood was irregular enough he just pushed the bottom slats together and nailed…but it is important to note during this step to leave a little space between the slats for water to drain out, but not soil. I usually stick a quarter between the slats which has always proven to be just right. And there you have it. Here is one I made from Redwood and screws in 2010 (in front) and the new Pallet one (in back). Similar—-but there are few subtle differences. *The new one is a bit wider than the other. As far as size go, I pretty much try to maximize my table space. If you table is a 3×6 (which many tables are) you can fit 9 2×1 flats on it. That should be more than enough (much more in fact) for all your seedling needs. Remembering, when you start seeds in wooden planting flats you will need to divide them or thin them before they reach the garden, so leave space in you table(s) for transplants. This is basically bio-intensive gardening, but more on that later…here is the next step if you are eager. Wooden Flats are a great thing to add to your garden shed if you find yourself starting seeds every year. They are pretty simple to make, relatively cheap and last many years, not to mention they are NOT plastic. They work beautifully to hold moisture and give ample space for those babies to grow. Many farms use them, which is where I learned about them. Here are a few I stumble across while ambling through a sleepy farm in Colorado last spring. Yes, I take pictures of other people’s planting flats, I told you I was a farm tourist. Good Luck and I hope you help rescue one more lonely pallet from the back of your hardware store and put it to good use. When you are ready here is a link to how to make potting soil for the flats and one on how to plant into them properly. Let the sowing begin!! All Prepped up and ready to Sow! And then the Zen art of raking a bed, brought me back to my days at CASFS, where I studied gardening as a fine art. We would spend what seemed like hours, leveling and raking the beds, so they were perfect plane and the very finest of tilths. The finer and fluffier the bed is, the easier it is for those tiny seeds to nestle in and take root. Ahh.. nothing like the joy of seeds well sown. I covered them with a thin layer of straw so the birds wouldn’t get them too quickly, and of course to keep the freshly raked soil nice and moist and warm. I also placed 19 gauge wire hoops over it, for when I cover them with row cover when the cold does come..and they act as a good baby deterrent too, though he was not too happy about not being able to walk on my perfect bed..
Ok big watery harvest moon, rain down and let’s get one more salad crop out of this season. This post is a little over due, that is if you are following my garden advice, but not to worry it is not too late to plant your fall crops. The past couple of weeks have been busy around here and it seems any garden time I have is going to preserving rather than planting. But in this high desert garden spring and fall are optimal time for planting and reaping. 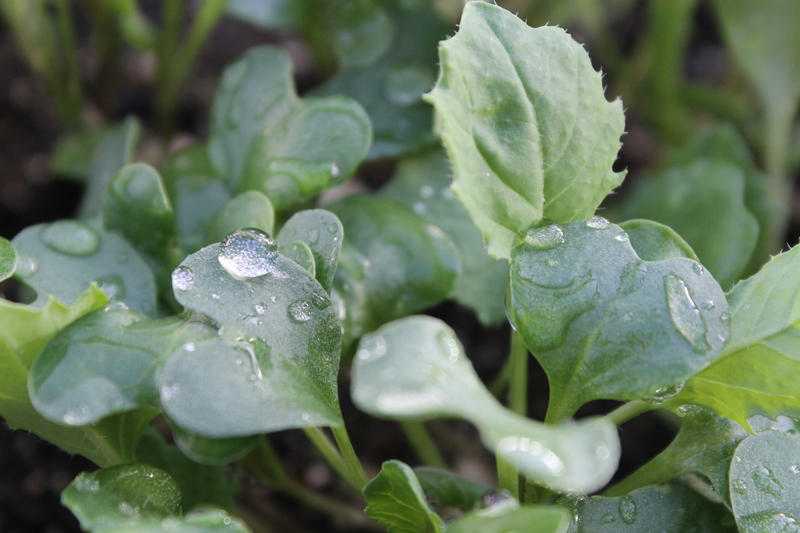 The cool weather and rains that the ‘shoulder seasons’ provide are great for greens, roots and many herbs. Come late July and early August I fill in all those nooks and crannies that have been opened up by summer harvests with all kinds of leafy goodies. For example the garlic bed dug in July is now sprouting with fall lettuce and the potato bed will soon follow with more salad greens. Sometimes you can even plant among big shady things in the heat of the summer if you know they will be coming out soon enough to give over the light and nutrients to the little guys, this is what they call using a nurse crop. I harvest my broccoli, move the irrigation over just a couple of inches and plant spinach. In a couple of weeks the spinach will have germinated, the brocoli be done and ready to pull out( I actually just cut it off at the base and leave the root as to not disturb the bed too much, when forking happens in spring they will all come out). When using a bed continuously it does require some top-dressing of compost, but there really is no need to re-dig the whole bed. Just scratching where you want to seeds and covering them with a light layer of compost should do the trick. Now if you like charts there is a great one Eliot Coleman has in the back of his book, Four Season Harvest on when to sow fall plantings. Which I believe they have at the library, which I guarantee if you read the whole thing you will need no advice from me!! Wow that was a lot of information, but when it is all said and done you could just do what I do; scratch some dirt, throw in some cilantro, lettuce, spinach, dill, arugula, mache, carrot, turnip, beet, kale and chard, cover with compost and call it a day!! Don’t forget to leave a little open space for the October garlic planting, oh, and pray for more rain! !